This is the central idea of Chapter 6 and one of the most important ideas in the entire book. Are you the kind of person who's interested in truly creative solutions for managing your expenses? Can you determine honestly and objectively whether a purchase is a real need, or if that "need" is based on mere social conditioning or status seeking? Can you look beyond that thing you think you want, and instead seek to satisfy the core need beneath that want? Do you even have to buy something to satisfy that core need? Very few of our needs are material. Sincere YMOYL readers will systematically ask these questions about all of their expenses with one goal in mind: to get your costs down--way down--so you can accelerate your progress toward financial independence. If at this point you're asking "How? How do I get my costs down?" that's for you to decide, and it depends on how creatively you choose to address this challenge. Are you the kind of person who demands money-saving tips to come to you, but then shoots most of them down? Or do you actively choose to seek out ideas to save money--and actually apply them? After all, tips and ideas are everywhere: the internet is filled with personal finance blogs offering advice and solutions on how to save more. I think that might be one of the reasons the authors radically revised this chapter in the current edition. In older editions, Chapter 6 contained a huge 23-page section called "101 Sure Ways To Save Money" that was loaded with all kinds of specific money-saving tips. In the 2008 edition, they cut out that section and refocused the chapter on more thematic savings advice. After all, YMOYL is less about offering specific individualized advice and more about helping readers think differently. I'm guessing the authors would prefer to create enterprising, solution-minded readers who will seek out their own answers to getting their costs down. Teach a man to fish, in other words. It's implied that readers must seek out their own solutions for their own specific needs. Of course, any list of ideas for saving money--it doesn't matter whether they're in "specific tip" form or "general theme" form--will have both hits and misses for any given reader. Some will resonate with you, some won't. Some will sound smart, some will sound stupid. And some ideas will make some readers so angry that they'll literally give up on the book. Laura and I have an acquaintance who literally quit reading YMOYL right here, in this chapter. Why? Because she stumbled onto a tip to cut your own hair, and for whatever reason, that tip literally set her off. She even wrote an angry email to me about it, saying she couldn't believe this book would suggest this--and no WAY was she ever, ever going to cut her own hair. So she put the book down and stopped reading. There are two layers of tragedy here. First (and worst) is how her reaction to a tiny (and irrelevant) part of the book caused her to reject the entire body of work. It shouldn't surprise readers that this acquaintance has made zero financial progress since. Which raises a personal question I'd like to ask readers: Do you really seek solutions as you work on your financial situation? Or are you waiting, just waiting, for the first sentence that pisses you off and gives you a "reason" to throw the book across the room? The second layer of tragedy was that our acquaintance never attempted to explore her visceral reaction. Why did she put down the book? What was it about this specific tip that made her throw the baby out with the bathwater, that triggered her to spontaneously reject an entire ecology of insights on how to improve one's financial situation? When you read something that makes you out-of-proportion mad (and money-related topics tend to do this to lots of us) it usually means you're scratching at some important inner truths. That trigger, that feeling, that emotion... there's almost always something there, if you're willing to explore it. There might be an insight into a problem, or a solution to a mental block, or you might have uncovered an unconscious mental script in your mind that's somehow holding you back. Dig, and find out what's going on there. I'm betting that mental script impacts other areas of your life too, and you'll be glad you uncovered it. On impressing others: Let's spend a moment on the theme of impressing people, because it also has two layers: an obvious layer and a not-so-obvious layer. As the book says, if you stop trying to impress other people, you will save thousands, perhaps millions, of dollars. Obvious. And yet when I look back on my Wall Street career, I can think of many, many well-educated, thoughtful and extremely bright people who spent enormous amounts of money impressing others. Why? Well, in most cases they somehow managed to convince themselves they weren't trying to impress other people--while they bought stuff to impress other people. Which takes us to the not-so-obvious part. Your ego will always try to convince you that you never try to impress people. After all, that's something only an insecure person would do. You (it will reassuringly tell you) being the confident and highly self-aware person that you are, would never do anything that shallow. Right? Right?? Yep, that's your ego talking. 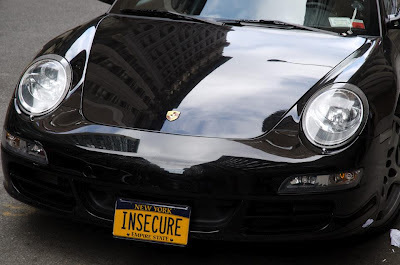 Self-aware Porsche owner (photo by Michael Goldsman). Your ego, which understandably wants you to have a good self-image, will therefore work very hard to convince you that you need that gazingus pin. Or Lamborghini. Remember this the next time you try and tell yourself you're not trying to impress others. A final word before we get to the Appendix/Side Thoughts. I'd love to hear your creative and unusual ideas to save money as you work through this book. I'm looking for all kinds of ideas, because you never know what might help--or set off!--another reader who reads this series in the future. It could be anything: how you eliminated your car and started using Zipcar, ways you've creatively reduced your housing costs, creative bartering or job-exchanging arrangements with friends or neighbors, how you rethought family entertainment, baby-sitting, how you used Couchsurfing on your last vacation, and so on. If you've got a creative idea from your life that's lowered your expenses and helped you meet your needs differently, share it in the comments! 1) Finding "quick wins" for saving money: There's no reason getting your costs down has to be unnecessarily difficult, so start by looking for steps you can take quickly and efficiently. Better yet, look for steps that serve you in multiple ways. A few examples: reducing the amount of meat in your diet, and you'll improve your health and save money on food. Using an inexpensive bicycle can help you save on gas, commuting costs, gym memberships and future medical bills. Buying a smaller home will save you tens (or hey, hundreds) of thousands of dollars on mortgage costs, energy costs and taxes. And so on. 2) On insurance: I could easily write a full post on insurance [Edit: hey, I did write a full post on insurance! ], but for now, let me just make this point: As you get out of debt and on your way towards financial independence, you will find you don't need the insurance you thought you did. Once you have several thousand--or even tens of thousands--of dollars sitting in the bank, you will be able to significantly increase your deductibles on things like auto and health insurance. This saves you hundreds or even thousands of dollars of per year in insurance premiums. 3) Apply the "wear it out" concept to big-ticket items and save boatloads of money: Wearing a shirt for 30% longer might save you a few bucks, which is nice but not meaningful. But driving a car 30% longer (or heck, 100% longer) can drive gigantic financial results. Get your big ticket decisions done right and the smaller expenses don't matter so much. 4) Impulse purchases: According to the book, half of our purchases are spur of the moment (PS: I've found this clearly holds true with grocery shopping). This is awesome, because it opens up an enormous savings opportunity: by applying just a few minor techniques to minimize impulse-related purchases, you can slash your spending in half. This tip is a lot less obvious than it sounds. Q: How much money does it take to raise children? And yet if there's one thing my years on Wall Street taught me, it's that the consensus is often wrong. Often grievously wrong. With that in mind, I found it particularly interesting to read (on page 189) about how one couple applied the Fulfillment Curve to save tons of money on gift-giving for their children. Granted, Laura and I don't have kids, so I'm clearly out of my depth here--but I'd love to hear readers' views and ideas on creative ways to save money when raising children. And don't tell me there's no solutions out there. 6) Gift-giving: One more thought on gifts: one of the greatest days of my life was when my family changed our holiday gift-giving routine from "everybody buys everybody a gift" to "we put all our names in a hat and each person draws one name." Instantly, Christmas became one tenth as expensive and a million times less stressful. Recently, we took it one step further and dispensed with gifts altogether. Hey, the holidays aren't about gifts, they're about getting together with loved ones. Why not focus on that? What does your family do about gift-giving during holiday time? Anything you buy and don't use, anything you throw away, anything you consume and don't enjoy is money down the drain, wasting your life energy and wasting the finite resources of the planet. That said, don't let your concern for the environment make you into an easy mark for marketers. Keep in mind that "green" is slowly but surely being twisted into another aspirational market segment designed to persuade you to spend more money. Don't be deceived: Should I buy a new one? is the wrong question. Do I need to buy this at all? is the correct question to ask. 8) "I'm enoughing" I love this expression and I'm going to start using it. Honey, I'm not going to buy that Fabergé Egg after all. I'm enoughing. 9) Lateral Thinking: One more book recommendation: Lateral Thinking: Creativity Step by Step by Edward De Bono. This book has heavily influenced my thinking on brainstorming, idea generation and looking at problems in different ways. Most of the ideas I've dreamed up on how to "meet my needs differently" have come from using principles in De Bono's book.